"Five hundred years ago no one died of stress: we invented this concept, and now we let it rule us. 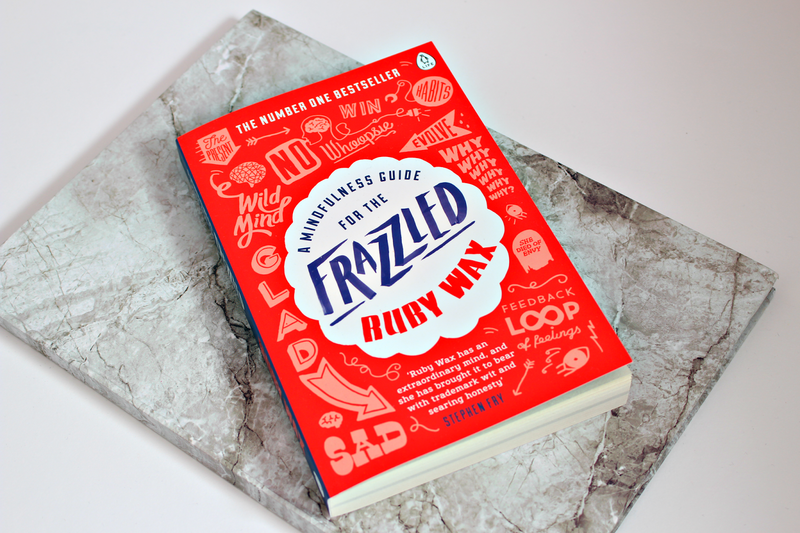 Ruby Wax shows us how to de-frazzle for good by making simple changes that give us time to breathe, reflect and live in the moment." She's got a point, hasn't she? Years and years ago, stress wasn't even a thing yet today it is the biggest reason for sick leave, alongside anxiety and depression. So I mean it's safe to say this concept we have invented is pretty damaging. Okay, so you want to reduce your stress and anxiety levels. You want to spend more time living in the moment, being healthier and happier- this is where The mindfulness guide for the frazzled comes in. Thank you, Ruby Wax. I'm going to hold my hands up from the get-go and say that I haven't read this book from cover to cover and I can't pretend that I have. But there is a very good reason for that. The brilliant thing about this book is the way it is divided into sections, which are pretty timeless. I can see this book on my shelf for years and years to come, even when I'm old and decrepit, and my biggest stress in life is when Waitrose put the price of cat food up. Yes, I'm going to be an old cat lady. There are chapters in this book dedicated to mindfulness for parents, babies and children- none of which I am. Thank God! As ya know, I'm only 18, I'm not quite ready to give my life up just yet. I, therefore, didn't read that chapter because it wasn't really relevant to me. However, there is a chapter dedicated to teenagers and OMG it was such a good chapter. So much useful advice, tips and techniques! I won't spoil the rest for you because you really need to go and pick this book up and give it a read for yourself. But what I will say, is that it's your full proof, timeless guide to mindfulness and you won't need another self-help book EVER. It's full of science, scientific drawings (trust me!) and a six-week mindfulness course, which I am currently testing out but looks very positive so far! If you are sick of the boring, preachy self-help guides which overload you with Buddism and kale (I know, your pain I study Buddhism at A level), then you need to get yourself a copy of this book. It's oozing with Ruby Wax's hilarious wit, which is sure to alter your perspective on mindfulness. 8. Watch a feel-good box set, like My Family or Outnumbered. If you not from the UK, you have no idea what I'm on about right now. There's you thinking I would say things like 'Have a nice long warm bath with my favourite Lush bath bombs' ew no! I'm so odd and would rather watch a programme about people being killed. I'm too weird for my own good sometimes. You are probably not looking to take any of my advice away with you. I can't say, I blame you. I don't trust my advice either, which is kind of worrying. But you know, whose advice I do trust? Ruby Wax. If you are in serious need of a Defrazzle in 2017, pick up this book and trust me you're be using it in 2027. Unless we all live underwater by that time...oh wait, no, that was the year 3000. 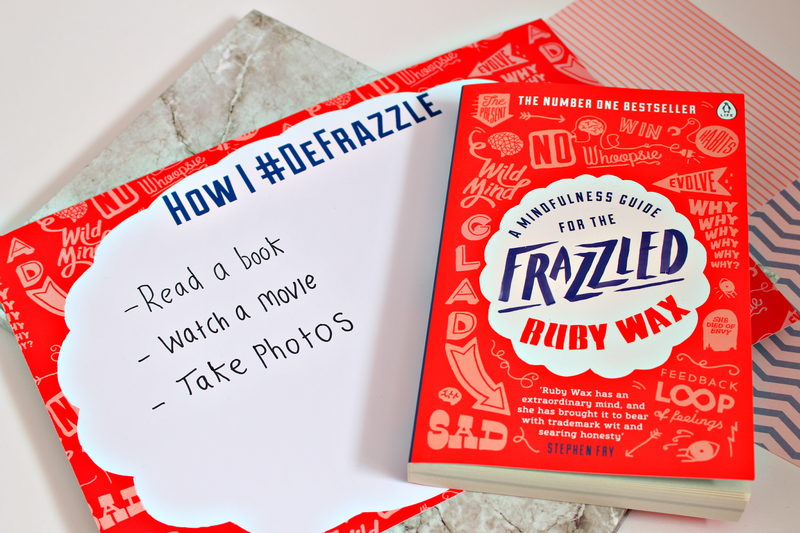 Let me know, what makes you Frazzled and how you #Defrazzle in the comments below! I would love to know if your ways are normal or as bizarre as mine! This is such a great post and so relatable! This book looks fab, I love your number 9, I doodle when I have a spare minute! I find it really chills me out, it's so important to take time for yourself. First off: What a fab word! Totally going to be using that - if anything to make me smile/giggle when really I'm falling apart panicking inside! Haha! I definitely agree - all your points are very likely to get anyone 'frazzled' - uni work and deadlines as well as various social and personal struggle definitely get me stressed and send my anxiety levels sky high! You've got some great coping techniques though - Harry Potter or Disney are definitely great relaxing techniques (in fact currently watching Chamber of Secrets post 3rd revision break down of the day!) 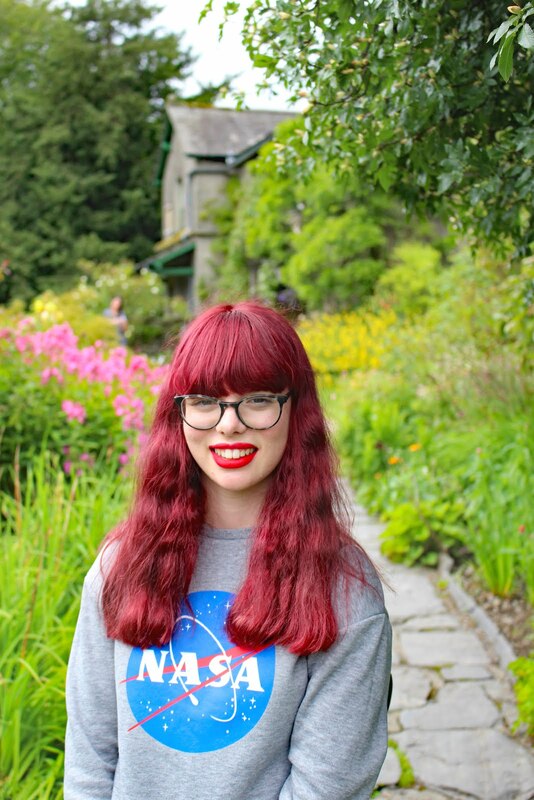 - I find reading blogs like yours a great way to destress as it feels like I'm listening to friends! I also totally understand cleaning and organising or even just washing and doing my hair or putting make up on makes me feel that little more like I've got my life together! I love this post Nicole, I picked up this book yesterday and can't wait to get stuck in. I absolutely love taking pics to defrazzle too, but due to my health it can be really painful and meh, yeh, I have to pace it. I love this post! I love that you also love the word defrazzle, it does sounds pretty good! I definitely need to pick up a copy of this book soon! I love this! I've never tried a fudge hot chocolate from Starbucks but it sounds gorrrrgeous! I have literally just gone and purchased this book on Amazon Prime after reading this post. It arrives on Monday! After the meltdown I had last night, this is exactly what I need in my life so thank you so much for bringing it to my attention! I need this book! I'm definitely a 'frazzled' kinda person, with too much stress and anxiety ruling my life. Awesome blog post, I'll pick up the book when I have time!